The number of trees that populate the Asheville, NC area are innumerable. However, the health and conservation of trees are aspects that are often taken for granted. Any tree on your property should be evaluated on a routine basis. Call Family Tree Services today for a professional tree synopsis. It’s better to catch problems early before it’s too late. Trees afford a multitude of benefits to the world. However, the belief that trees are self-sufficient is a falsehood. There are various factors that can expose a tree to harm. Weather related issues, illnesses and broken branches are all examples of vulnerabilities that trees are exposed to on a daily basis. Let us no longer sit idle in Asheville, NC while our trees stand unaccompanied. Do your diligent duty and let Family Tree Services provide the care and attention that your trees so desperately need. Trees embody characteristics of strength and magnificence. Tree sizes range from very small and thin to large and towering. However, tree size is no match for the forces of nature. To combat nature’s elements, tree pruning is a common practice that aids in the production of stronger branches. As a result, your tree will be able to better withstand the fury of nature when it strikes. Trees can greatly profit from tree pruning as it improves the angling of branches. Branch angles are important as branches that have constricted angles cause a tree to become weak. This tree weakness occurs because branches in close proximity to each other lack the needed space to develop wood. Creating new wood is paramount to the strength of a tree. By simply taking off one or more branches using a branch cutter, this problem can be eliminated. Keeping a center of gravity is also a principle of tree safety and health. Pruning that is performed in the appropriate manner can enable this. Large trees that share a landscape with a building should have their center of gravity evaluated often. Numerous branches at a specific angle or the absence large support limbs can decrease a tree’s center of gravity. In the event of a storm, a bad center of gravity increases the chances that the tree can topple. This poses a severe threat to property. Branch cutting using a common branch cutter tool greatly diminishes this possibility. When cutting branches, it’s important to remember to not get carried away and cut branches too short. Doing so will create newer, yet fragile branches. Branches that are feeble have a much higher chance of becoming broken branches if a storm strikes your area. Be proactive and don’t wait for a storm to arrive. Family Tree Services is waiting for you to call. Set up an appointment today. As a tree grows and its branches become larger and longer, rubbing branches will be an inevitable phenomenon. It may appear to be harmless, but it’s very sneaky and can cause great harm to your tree. As branches rub together, it causes chafing and abrasions. It won’t be long before wounds begin to appear. Once this happens, the chances that diseased branches will develop increases drastically. Depending on the surroundings and the time of year, a disease can overtake the tree causing a decline in health. An unhealthy tree can fall over on its own, or with the assistance of strong winds. Diseases display themselves openly when they develop from rubbing branches. Slower than normal tree development, unusually small leaves and fungus growth are all characteristics of a tree that is diseased. If disease has attacked, but is caught in the early stages with only a couple fungus-bearing branches, Family Tree Services is eager to remove those diseased branches immediately. We will act with swiftness because we know that once disease has spread far enough, your tree may not be able to be revived. Therefore, as ordinary as it may seem, branch cutting can save your tree’s life. Have We Ever Had To Chop A Tree Down? Trees help people in so many ways. People usually have picnics under trees so they can be shaded from the strong rays of the sun. Tire swings may have never gained popularity if trees didn’t provide strong limbs for them to hang from. Elaborately designed houses have also been built in trees for children’s entertainment. However, sometimes the fun has to come to an end and the unfortunate job of tree removal must be done. It probably should go without saying that if your tree has died, it’s a must that it be removed. Waiting too long for tree removal means that trouble is brewing for your property. Also, there are many trees that discharge sticky sap that can stain your sidewalk and damage the paint job on your house and car. Your tree can become extremely dangerous if it is found to have a cracked trunk. In this case, tree cutting and removal may be the only options. A cracked trunk can cause your tree to fall over even on day with perfect weather. 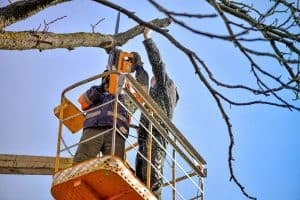 The professionals at Family Tree Services can provide you with sound advice and deploy a qualified tree cutter if necessary. If tree cutting must be done, it’s important that you look on the bright side. Family Tree Services can plant a new tree that your family can watch as it grows. We hope that we’ve explained aspects of tree care in an easy to understand format that allowed you to gain knowledge. Also, it is our hope at Family Tree Services that we have made you more aware of the importance of tree care. Even if your tree only requires simple maintenance, we do not encourage you to complete it yourself. Be sure that you lean on the advice and service of a tree professional. A knowledgeable and responsible tree cutter(s) (or arborists) from an upstanding company can deliver the proper results so that you can enjoy your tree for the foreseeable future.